For a Hobbyist, Bread board is the common solder less circuit board to make the Prototype before assembling the circuit on the Etched PCB. We usually power the Bread board using Battery or DC adapter. It is a good choice to attach a Variable power supply permanently with the Bread board so that we can select any voltage for the circuit. For example some circuit requires 3V or 5V and some other circuits require 9V or 12 V. So by attaching the Variable power supply to the bread board, we can easily select the required voltage for the circuit. The variable power supply described here can provide 1.7 V to 13.75 V by adjusting the Pot. Let us see the Project. 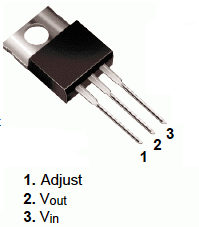 1.25 (1+ R2 / R1) where 1.25 is the reference voltage at the Adj pin. If you use a variable resistor in the place of R2, you can vary the voltage to different levels from minimum to maximum. 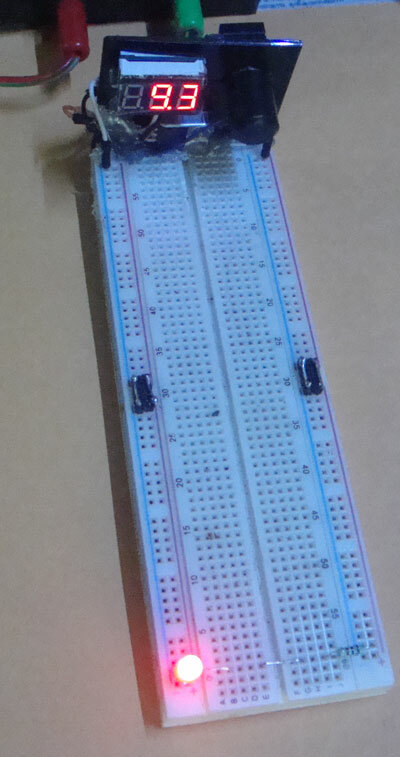 Here the circuit uses 1K resistor as R1 and a 10K pot as VR1 ( R2 ).Input voltage is 15V DC. 1.25 ( 1 + 10,000 Ohms / 1000 Ohms ) = 13.75 V.
Input voltage to the Variable power supply can be from 9V battery or a 15 V 500 mA Adapter. 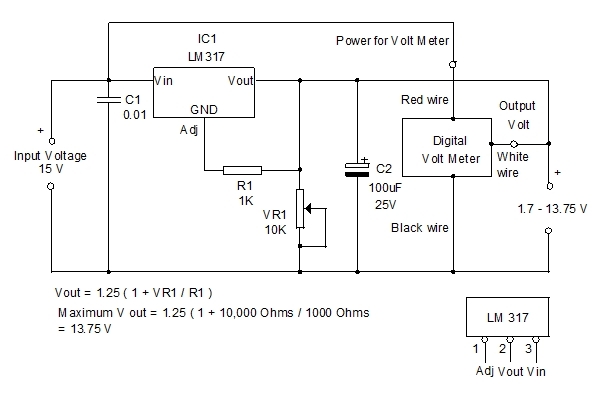 If a Digital voltmeter is connected at the output , it is easy to see the output voltage . In the circuit, a Mini digital volt meter is used at the output. It has three wires. 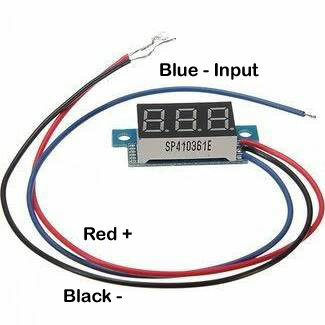 Two wires (Red and Black) for its own power and a Third wire ( Blue or White ) for taking output voltage for the display. So the Meter will display the exact output voltage. Remember, the power for the Voltmeter should be tapped from the Input volt. The third wire should be connected at the output of the circuit.